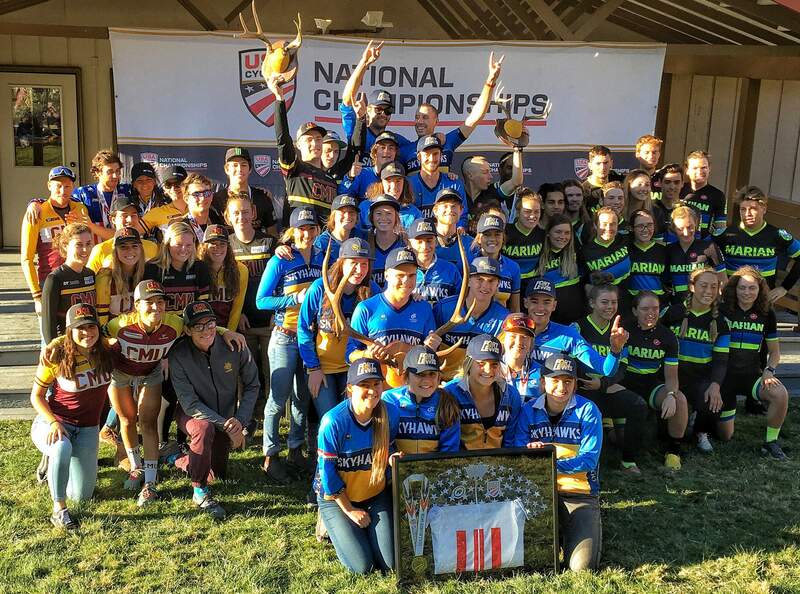 Fort Lewis College won its second consecutive USA Cycling Collegiate Mountain Bike national championship Sunday in Missoula, Montana. The now 24-time national champion Skyhawks will host next year’s mountain bike nationals at Purgatory Resort against challengers such as this year’s second-place Colorado Mesa University and third-place Marian University. Fort Lewis College already had a 70-point lead on Colorado Mesa University going into the downhill and team relay races Sunday. When McCauley Smith won her second consecutive national title and an impressive relay team brought home yet another gold, the Skyhawks celebrated a second consecutive USA Cycling Collegiate Mountain Bike varsity national title. FLC’s win Sunday in Missoula, Montana, gave the Skyhawks’ cycling program a 24th national title in program history. The long dominant mountain bike team had one of its deepest rosters ever, and it showed during the three days of racing. FLC got out to a big lead Friday after the men’s and women’s cross-country mountain bike races. Cole Paton, Cooper Wiens and Henry Nadell took first through third, respectively, in the men’s race. Hours later, Savilia Blunk added a second-place finish backed up by a sixth-place result from Durango’s own Ellen Campbell, and all five of the FLC women finished in the top 15. The Skyhawks kept up the pressure Saturday on familiar ground, as FLC’s national title in 2017 also came in Missoula on the same course. In the women’s short-track race, Blunk this time got the better of Colorado Mesa University rival Gwendalyn Gibson, who had beat her a day earlier. California’s Blunk built a big lead and continued to grow her gap each lap through the single-track section. Blunk finished in 25 minutes, 51.6 seconds. Gibson was second in 28:15.7. Campbell finished fifth in Saturday’s short-track for the FLC women, while Stella Sisneros was 10th and Durango’s Camryn Sippy placed 14th for the Skyhawks. Kelsay Lundberg added a 22nd-place result. In the men’s short-track race, Paton made it a sweep with another victory. He backed up his cross-country win with a four-second victory in short-track ahead of Brevard College’s Tyler Orschel. The FLC junior from Washington finished in 26:42.4. Right behind Paton was Nash Dory of FLC, who was fourth. Nadell was fifth, and Wiens placed 12th. Thomas Gauthir crossed the line 21st for FLC. Sunday was a day for downhill, and FLC’s Smith was the defending women’s national champion. With a target on her back, the rider from Boulder flew down the course faster than any competitor for a second consecutive title. A night earlier, Smith led FLC with a sixth-place finish in dual slalom under the lights. Elena Runyan and Lacey Andersen took 10th and 11th in the slalom, respectively, and Morgan Shippen placed 14th. In Sunday’s downhill, Andersen, of Durango, placed third, while Runyan was fifth. FLC’s men were led in dual slalom by Drey Smith, who placed seventh. Jaren Lockwood was eighth, Benjamin Bennett was 10th, Shane Ellis was 15th and Asa McGill Howe was 16th to fill the top 20 with Skyhawks. In the downhill, FLC placed every men’s rider in the top 15, as the top-four riders took sixth through ninth. The team relay was made up of Blunk, Campbell, Dory and Paton, who was the anchor. FLC had total confidence it would close out a national title in the event. “We all felt good, and it was so exciting,” Blunk said. “We had the whole team there cheering with it being the last event. It was a super awesome vibe that I’ve never felt before. It was my first team relay, but everyone had a plan. Luckily, we had no mechanicals or anything, so we were able to get a gap on the last lap with Cole out there to bring it home. Next year, FLC will host the collegiate mountain bike national championship races at Purgatory Resort.